The trip with Easy Jet went perfectly and we even arrived early at our home exchange which gave us time to have a look around us. 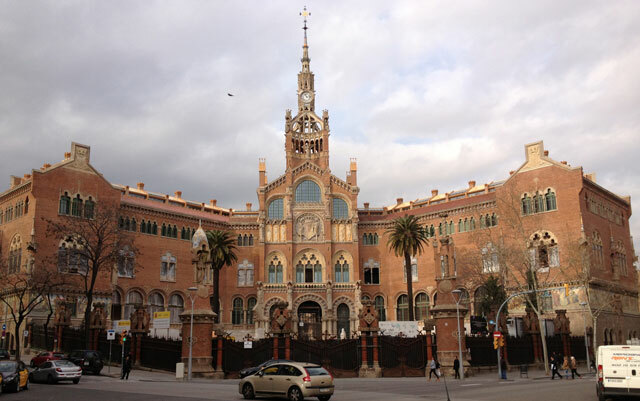 We’re just across the road from the former Hospital de la Santa Creu i Sant Pau in the El Guinardo neighbourhood, built between 1901 and 1930 and now a UNESCO World Heritage site. It ceased to be a hospital in 2009 and is undergoing restoration for use as a museum and cultural centre. 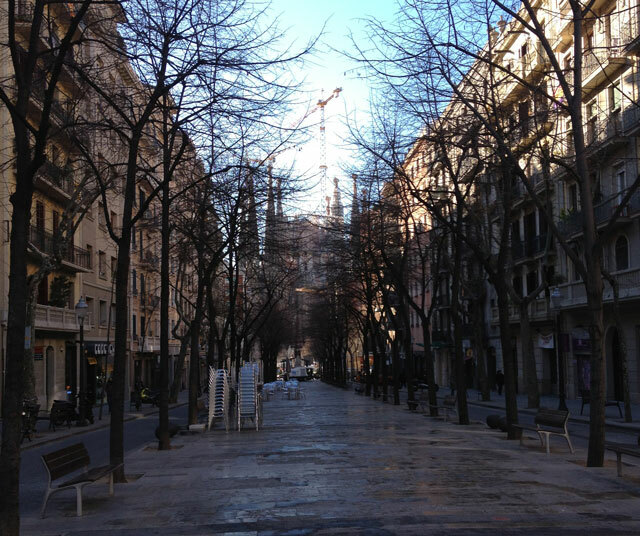 When you turn your back to Sant Pau you are looking straight at Gaudi’s famous Sagrada Familia cathedral. Our flat is on the 5th and last floor and a small flight of stairs leads onto a terrace where we have a spectacular view of the hospital. Unfortunately it’s a little cold to take our deck chairs up or we could have breakfast there! In the evening, at Pep’s suggestion, we went into the Barri Gotic which is the historical quarter of Barcelona. We decided we’d walk and it took an hour and a half! We were justly rewarded though. 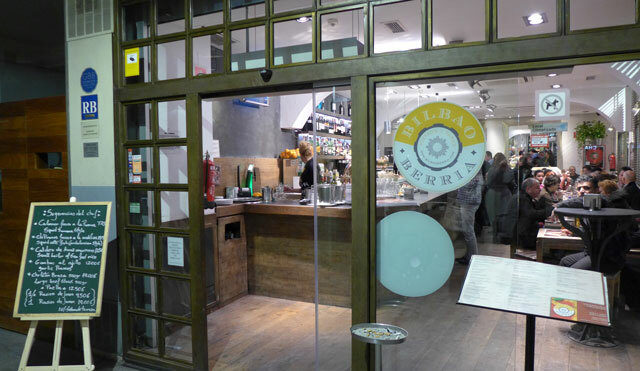 Pep had recommended a tapas restaurant called Bilbao Berria on the corner of Plaça Nova with its beautiful Gothic cathedral. We weren’t able to visit the inside because it was just closing. We found the restaurant and it was so good that I have a sneaky suspicion that we are going to be disappointed wherever else we go. 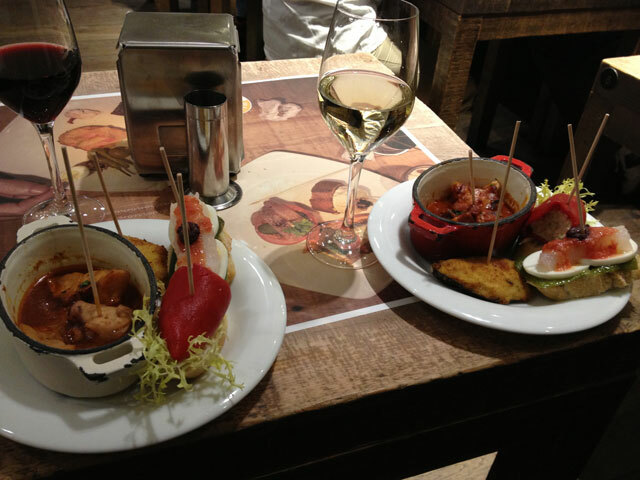 Theoretically, they weren’t tapas, but « pintxos », which are hot or cold finger foods with a skewer through them which you choose yourself from the bar. They all cost 1.65 euros a piece and from time to time, the waiter comes around and puts the skewers in a glass. At the end, he counts them all up. So much easier than looking at a menu! After all that walking, I stayed put and let Jean Michel choose the tapas. The variety was amazing. There were even mini hot dishes, one octopus and the other veal. My favourite had two sea scallops and 3 prawns! I have to confess we had second helpings, then I went and chose a couple of desserts! We decided to take a taxi home. They’re very reasonably priced here. Next morning we went and had a closer look at Gaudi’s unfinished cathedral but when we saw the queues of people waiting to get in, we decided to get tickets on line and come back another day. I’m not sure yet what I think of the cathedral. It’s very impressive, like a series of enormous stelactites but I’m not sure I like the naive sculptures and gaudy colours. I did wonder whether the word comes from the artist, but apparently it doesn’t. 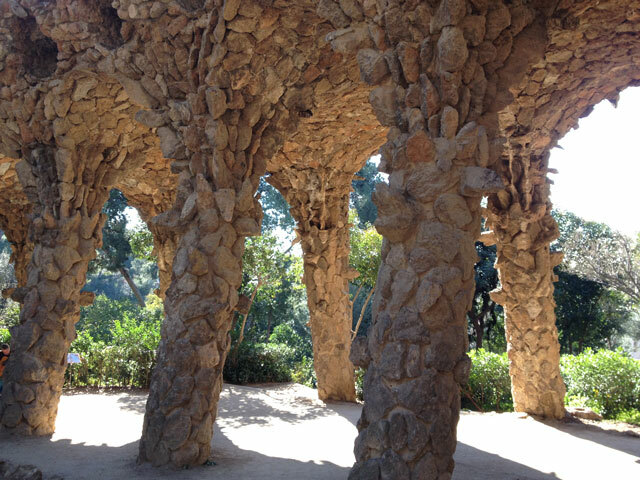 We then took the very modern metro to Guell Park, also decorated by Gaudi. A 10-ticket card that can also be used for the bus costs just under 10 euros, which is much cheaper than Paris. It took about 20 minutes to walk up the hill to the park from the metro station but despite the cold, the sun was out. I really liked the park, which was never finished, like a lot of Gaudi’s work, because Count Guell eventually ran out money. When we got there, there weren’t many people but by the time we left, it was crowded. Initially though it was very still and peaceful, with musicians scattered about playing classical music and Spanish guitar. 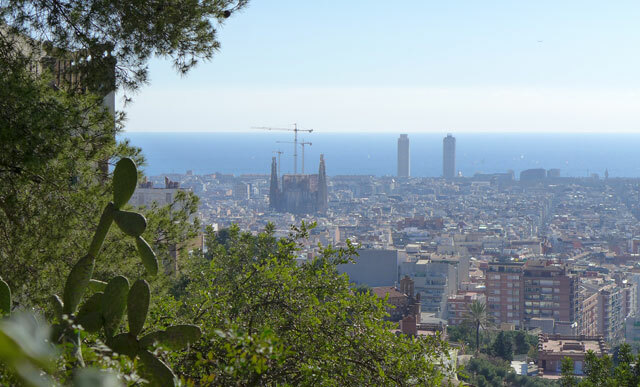 From the top there are sweeping, though a little hazy views of the city of Barcelona and the sea. So when we left the park, that is where we headed. 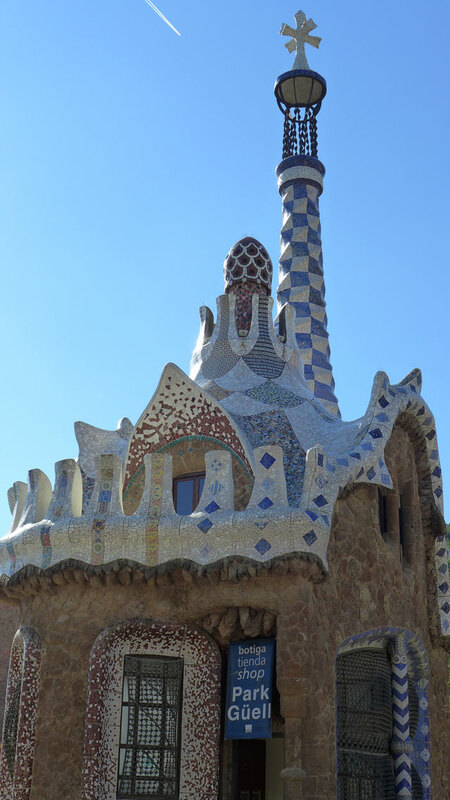 This entry was posted in Architecture, Restaurants, Spain and tagged barcelona, Bilbao Barria, Gaudi, Guell Park, pintxos. Bookmark the permalink. Oh, I’m so glad, we’re going next week-end! I’ll be writing all this down!!! 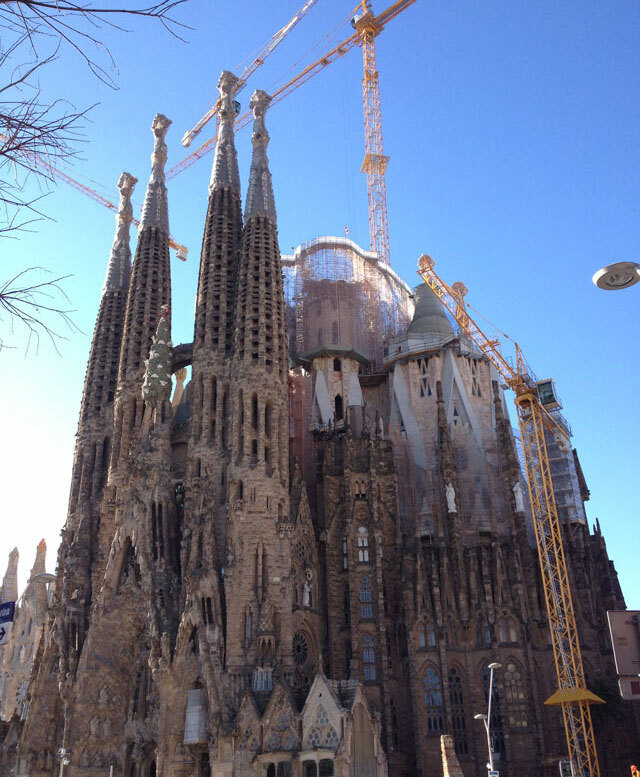 LIke you, I’m not sure whether I like Gaudi’s unfinished cathedral though I have only seen it in pictures. We grew up with a simple parish church actually designed by my grandfather. I tend toward simplicity and minimalism in design. I don’t know how much it is in the genes or culture we grew up in. I found Milan cathedral to be an overdecorated wedding cake (gasps of horror!!) whereas my late husband who was of Italian heritage marveled at it and how it was still being added to after several hundred years. I would like to check it out when I am next in Sydney visiting my youngest daughter but from the photos it appears very stark and cold – not what I expect a church to be. I do actually love the cathedral in Milan though my favourite of all times is the one in Orvieto http://www.aussieinfrance.com/2012/05/sundays-travel-photos-orvieto-italy/. It’s the naiveness of the sculptures on Gaudi’s that I don’t really like. But we’re visiting the inside today which may very well make me change my mind! I had a look at St Barnabas but it’s too modernistic for me! Have just seen your posts on Barcelona and Gaudi. The Sagrada Familia looks fantastic! We visited a long time ago back in 1970 – it’s amazing to see what they’ve accomplished since then. Love all your Gaudi pics, he was a true original. Having read the comments above would just like to suggest that there are so many ways of worshipping God and so many inspirational churches and cathedrals. The world would be a disappointing place if they were all pretty much the same. I love Milan Cathedral and also especially some of the truly gorgeous Sicilian churches and cathedrals, all so wonderful and such greaty variety from Baroque, Spanish and some more like eastern orthodox in style, the paintings, mosaics, glass etc, but I also love simpler styles too, like little old grey parish churches in England with a couple of glowing windows. Thanks for the feedback! Have a wonderful time in Barcelona!